What an honor to be invite by Thomas! is what i will be sharing! All CS1 & CS 2 presenters are kindly requested to be at EFSS by 1345 hrs. Presentation venues will be available for set-up from 1300 onwards. Please proceed to the hall (level 2 for registration) and our ushers will guide you to the presentation venue. Our TAs will be on site to provide technical support. Keynote address by Dr Elizabeth Koh, Assistant Dean (Research Support) and Research Scientist in the Learning Sciences and Innovation Program at the Office of Education Research, National Institute of Education (NIE), Nanyang Technological University. 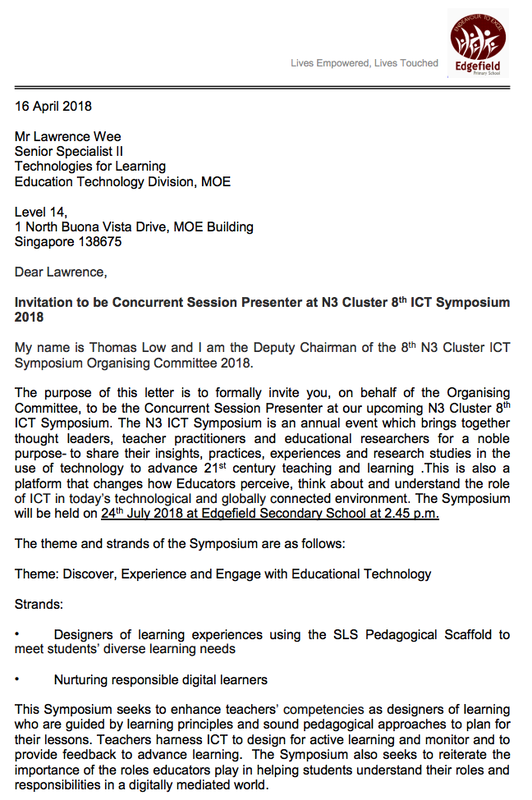 The purpose of this letter is to formally invite you, on behalf of the Organising Committee, to be the Concurrent Session Presenter at our upcoming N3 Cluster 8th ICT Symposium. The N3 ICT Symposium is an annual event which brings together thought leaders, teacher practitioners and educational researchers for a noble purpose- to share their insights, practices, experiences and research studies in the use of technology to advance 21st century teaching and learning .This is also a platform that changes how Educators perceive, think about and understand the role of ICT in today’s technological and globally connected environment. The Symposium will be held on 24th July 2018 at Edgefield Secondary School at 2.45 p.m. This Symposium seeks to enhance teachers’ competencies as designers of learning who are guided by learning principles and sound pedagogical approaches to plan for their lessons. Teachers harness ICT to design for active learning and monitor and to provide feedback to advance learning. The Symposium also seeks to reiterate the importance of the roles educators play in helping students understand their roles and responsibilities in a digitally mediated world. It is an honour for us to invite you as our Concurrent Session Presenter to present a talk entitled, “Using apps in primary Mathematics”. I would deeply appreciate if you could RSVP your availability to attend as our Concurrent Session Presenter by 25th April 2018. On behalf of the 8th N3 ICT Symposium Organising Committee, I look forward to the prospect of you speaking at our Symposium. total of 34 participants has registered for your session.